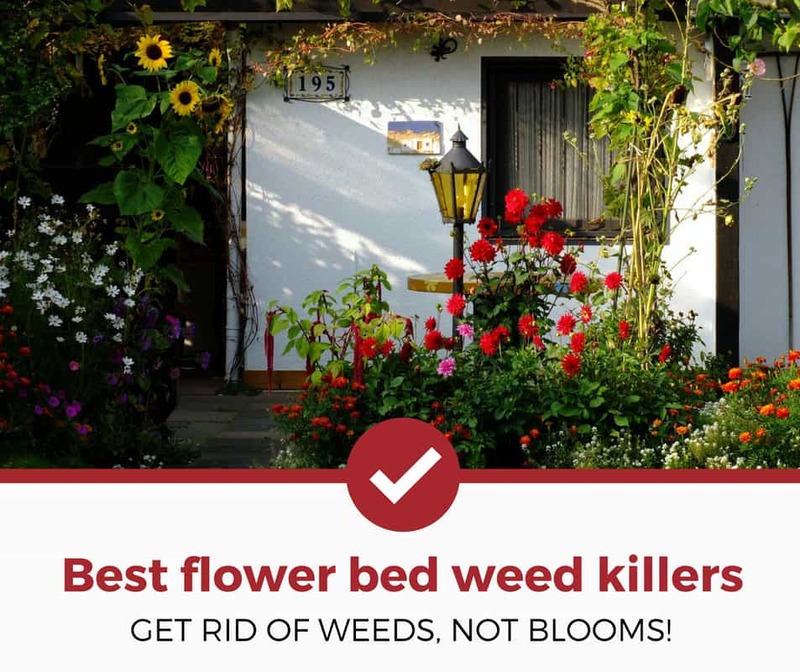 Looking for the best way to eliminate weeds in your flower bed in 2019? Then you're in the right place! Ortho offers a variety of pest control sprays, and they've expanded their reach by offering lawn control products as well. 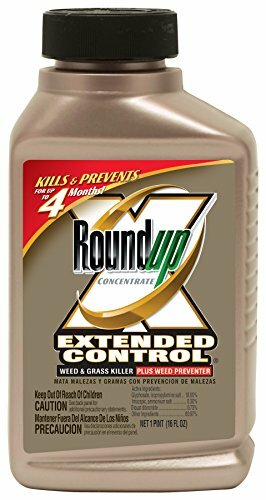 They've topped our list for the best weed killer for flower beds simply because their Weed B Gone MAX Plus spray is a blend of convenience and effectiveness in one affordable package. The spray is ready to use upon arrival; simply extend the attached wand and begin spraying! There's no mixing required, so there's no room for miscalculation. In addition, you don't have to purchase an additional spray apparatus in order to get the job done. The spray becomes rainproof within 1 hour after application, and results are obvious after just one spray. This weed killer won't damage desired plants in your garden and won't hurt your flower bed, but targets over 200 types of pesky weeds. Check out our full guide below to see all the options we reviewed, as well as learn more about what role weeds can play in your garden! Which Weeds Are Most Common Around Flowers? So, which type of pesky weed will you most likely find snaking around your lovely flower beds? Keep reading to get the scoop on a few of the most common types of nuisance weeds that infest desirable plant areas. Commonly referred to as an "aggressive turf," bermudagrass is a tough type of grass which grows in thick tufts and can withstand heavy dry spells and long periods of heat without dying. In addition, bermudagrass requires little maintenance or upkeep, and commonly bumps out other species of grass in an area, asserting a sort of evolutionary dominance. It's considered so aggressive that the state of Utah actually lists it as part of its Noxious Weed Act as a turf to be controlled and managed. These weeds look almost like horizontal vines, stretching out to form a floor of green across the ground. They have thick, brown stalks with green leaves branching out from the middle, and often coat an entire area within a short amount of time. When the brown stalk in broken, it emits a sticky milk that can help identify the weed as a spurge. Here's a quick video rundown on spotted spurge, along with photos to help you identify this common type of weed. These are sometimes prickly-looking, yellow systems which look more like dozens of small toothpicks than weeds. They prefer moist and wet soils, and can even sit dormant underground as seedlings for up to 10 years while waiting for favorable conditions to sprout! These particular weeds are a snap to spot, because the yellow spikes obviously jut out of green grass. Yellow nutsedge, however, looks a bit different from its spiny cousins. Check out what Lowell Sandell from the University of Nebraska Lincoln Extension has to say about this common type of weed. When you're shopping around for weed killers, there's a lot of talk about pre- versus post-emerging herbicides. What does that mean, and what's the better buy? This means that the weed killer targets a certain plant before it sprouts. Essentially, this substance goes into your soil and prevents the weed or plant from growing at all. This doesn't always work—in fact, for anything other than annual weeds, pre-emergent control methods have been shown to be ineffective. However, for most types of winter and summer weeds, you can expect to see results when using a pre-emergent herbicide. This is a product which targets weeds that have already sprouted. Normally, a post-emergent herbicide takes the form of a spray or—in some cases—granules. The weeds are targeted by the herbicide and then die quickly, within a matter of a few days or weeks. Post-emergent weed killers are split into two categories: selective and non-selective herbicides. For this reason, it's essential that you read the labels of weed killers carefully and protect your flower beds! The last thing you want is to accidentally douse your favorite blooms with an herbicide that ends up killing them. A few of the options in our list below require the use of a spraying device to administer the solution, which you'd have to purchase as a separate transaction. We recommend something like this: Chapin's 2-gallon backpack-style sprayer which can be used time and time again for anything from insect repellant to treating your home for termites. 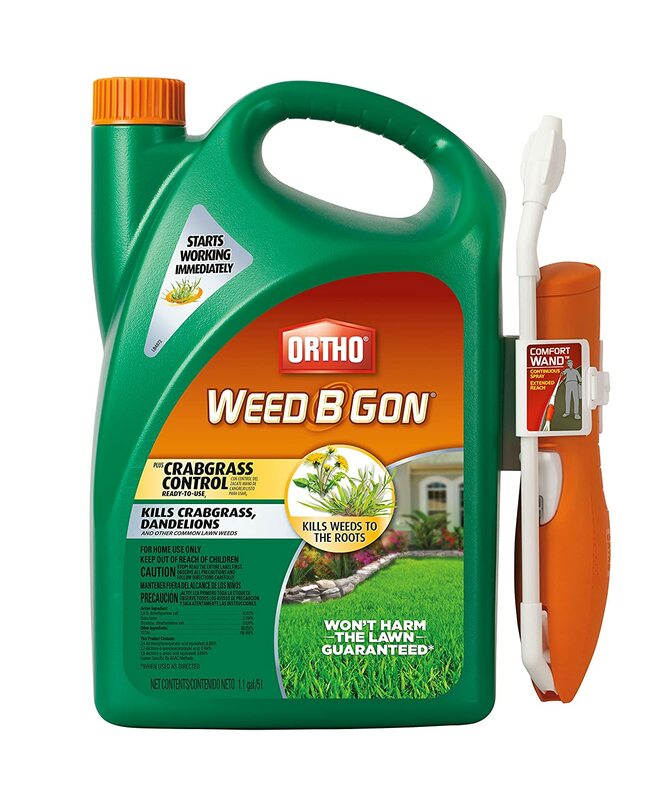 Ortho hit a home run with their Weed B Gone MAX Plus Spray: it's ready-to-use, it's hassle-free, it's affordable, and it's effective. This is why we rated it as our top pick. The 1.1 gallon container ships to customers pre-mixed with an applicator wand, which eliminates the need for at-home mixing (and possible miscalculation). Weed B Gone MAX Targets the unsightly weeds and leaves your desired plants alone, which means that it's an ideal way to take the pesky plants out of your flower garden. 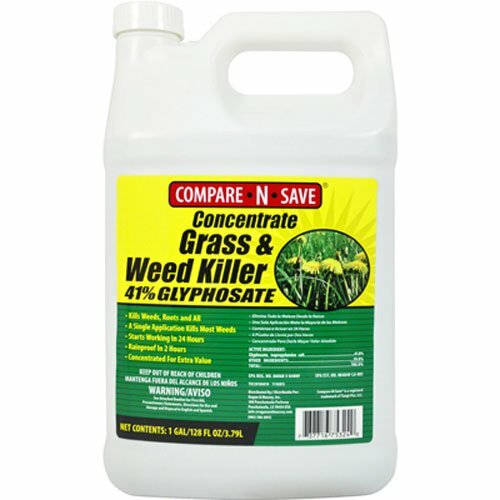 We recommend this weed killer to those who want an all-around effective way to eliminate several different types of weeds from their flower bed without killing their flowers. 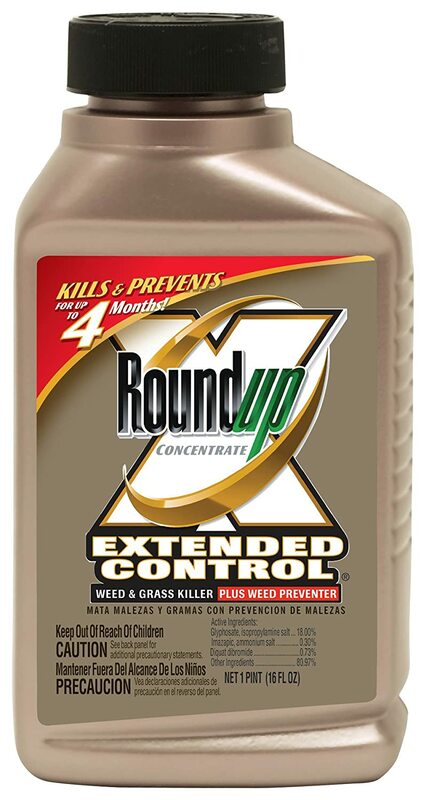 Roundup offers the total package in their Extended Control Weed and Grass Killer: a weed killer that kills existing weeds and prevents new ones for up to four months, a satisfaction guarantee, and a rainproof solution in just ten minutes. So why is this product our runner-up? These are certainly convenient aspects of using this particular product, but convenience often comes at a price. In this case, the cost of Roundup is much higher per volume than using Ortho, which is why we ranked Ortho in our number one spot and Roundup as number two. We recommend this product to those who want a fantastic way to kill the weeds around their flower beds, but don't mind paying a little extra for a few modern conveniences. Compare-N-Save Concentrated Grass and Weed Killer made our list because of its simplicity and effectiveness—basically, it just works. After the first spray, the solution coats your yard and gets to work. The weed killer begins to work on contact, and becomes resistant to rainfall within a matter of hours. Customers report being able to see results within 2 and 4 days! An external sprayer is required to be able to spray this solution across the yard, and this is sold separately. The good news is that this spray nozzle can be reused for many different endeavors, so it's a wonderful investment for your garden. We recommend this weed killer to those who want a seamless way to manage the weeds creeping into their flowerbeds without damaging their precious bulbs. 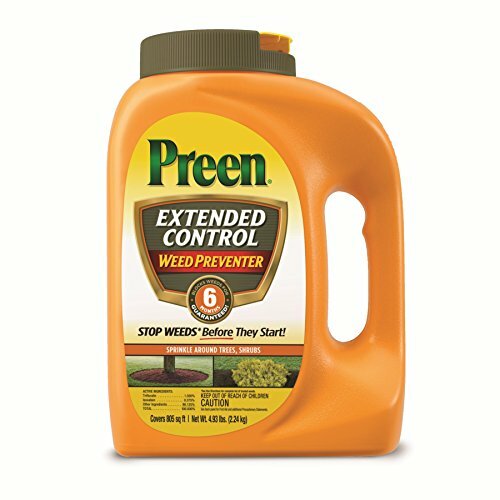 Preen Extended Control Weed Preventer is unlike any of the other options we've placed on the list—instead of working to kill weeds that have already sprouted, this substance works to prevent them from growing in the first place. Another stark difference is that this product isn't a spray or a concentrated solution. Preen uses a package of small, sand-like granules that are to be shaken across the garden soil then absorbed for efficacy. The granules are not selective, which means they will kill every plant they touch. However, you can protect your flower beds by covering your desirable plants with plastic or cardboard. This way, only the weed-growth areas are exposed to the weed-prevention granules. If you do happen to get some of the granules on your desirable plants, you can simply wash them with water immediately. Flowers can be re-planted into affected soil within days, so you don't have to let the presence of the weed prevention granules hinder you at all if you have a gardening weekend coming up! Here's the bottom line: nobody like weeds, especially when they invade our prized flower beds. This product targets over 200 types of nuisance weeds!